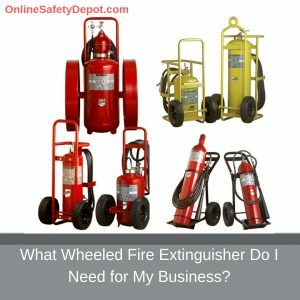 Home / What Wheeled Fire Extinguisher Do I Need for My Business? Having the appropriate fire safety equipment for your particular type and location of business is integral to your overall safety program. There are myriad fire extinguisher models of varying types, meaning the specific types fires an extinguisher is designed to effectively combat, and sizes, indicative of the amount of extinguishing agent contained in the fire extinguisher. Obviously, wheeled fire extinguishers, as compared to hand-portable fire extinguishers, are designed for fighting larger scale fires and as such, have unique characteristics that enable effective use in that setting. Wheeled fire extinguishers are the fire safety equipment of choice for many large scale commercial and industrial settings. Examples include building/construction sites, chemical plants, refineries, storage facilities, laboratories, ship docks, and off shore facilities. More and more they are being used in other settings like horse stables and large entertainment venues. These larger facilities require an immediate way to combat early stage fires. The requirement for a greater fire extinguishing capacity mandates a much larger tank, and the larger the tank the greater the weight of the fire extinguishers. The fire extinguishing agent capacity of wheeled fire extinguisher units are typically from 50 lbs. to 350 lbs. and can weight up to 800 or more total pounds. 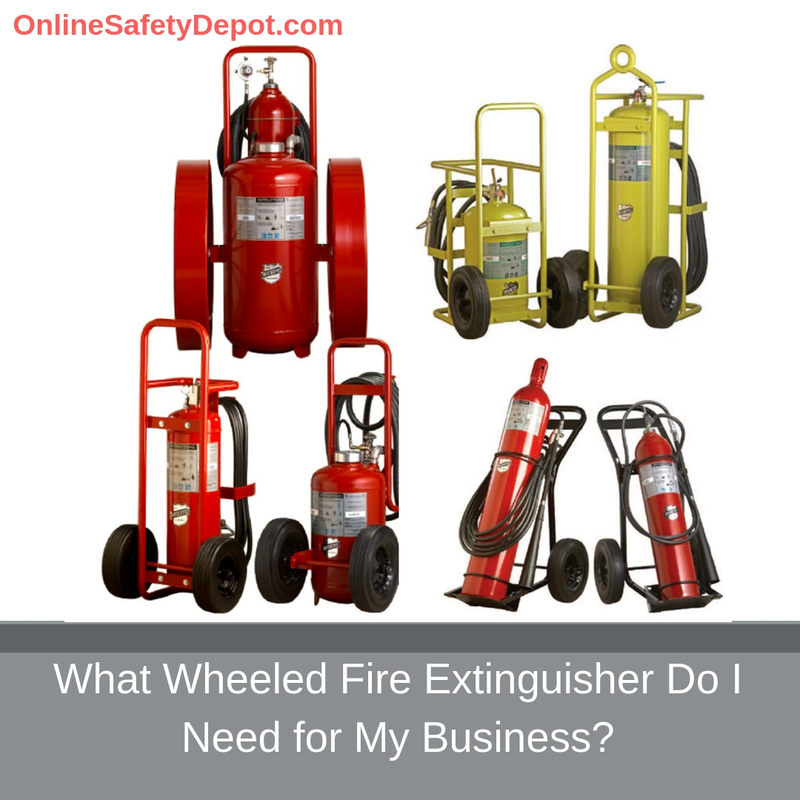 However, the wheeled fire extinguishers must be mobile and rapidly transported by a single person. Special features that make this possible require the extinguishers be designed with a broad base of support that includes a proper weight distribution, large semi-pneumatic rubber wheels or very large diameter steel wheels and unique handle positioning to ensure easily handling and maneuverability. Also important are extinguishes with higher flow rates, a greater distance of discharge of agent, and longer discharge time. Below are wheeled fire extinguishers by extinguishing agent offered by OnlineSafetyDepot.com.